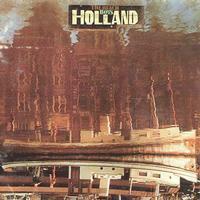 Holland in 33 1/3 RPM Stereo only; "Sail On Sailor" 45 RPM bonus track together with 12-inch EP included! Disc 2 EP: Side 3 is 33 1/3 cut of "Mount Vernon and Fairway (A Fairy Tale)"
Disc 2 EP: Side 4 is 45 RPM bonus cut "Sail on Sailor"
"The original is a standard jacket with a lyric insert and of course includes the EP. To make this work as a gatefold double LP with inside artwork that includes the EP cover art must have taken some time, effort and expense. It's been very well done." — Michael Fremer, AnalogPlanet.com. Read the whole review here. The Beach Boy's Holland, the group's 19th studio album, was recorded in Baambrugge, Netherlands in the summer of 1972 and released in January 1973. Our Analogue Productions reissue also includes a bonus 12-inch EP: Mount Vernon and Fairway (A Fairy Tale). Side 4 of the EP is a 45 RPM Bonus Cut of "Sail On Sailor" — Holland's famed lead track! By mid-1972, with Wilson's focus waning from the Beach Boys to other creative outlets, and his personal and health-related issues mounting, Wilson was producing less music for the band than ever before. They decamped for the Netherlands hoping to jump-start Brian's creative energies. Wilson contributed little to the album, concentrating his musical efforts on Mount Vernon and Fairway, a 10-minute long "musical fairy tale" eventually included with the album as a bonus EP. The title of the bonus EP was named after the intersection where the Love family lived in Los Angeles, and where the Wilsons and Loves would gather for family celebrations back in the 1940s and '50s when Brian, Mike, Carl and Dennis were all growing up. As a concept for a Beach Boys track, "Mount Vernon and Fairway" initially received a less than enthusiastic response from the other band members when Brian first presented the idea to the group, and this only fueled Brian's steadily worsening depression. Eventually, Carl stepped in to produce the recording for Brian, and the decision was made to include the fairy tale in the album package as a separate EP. Brian himself designed the EP's picture sleeve. Although Mount Vernon and Fairway (A Fairy Tale) was narrated by Jack Rieley, the voice of the Pied Piper was supplied by Brian in a slightly grainier-sounding "cartoon" voice. The instrumental tracks for Mount Vernon and Fairway (A Fairy Tale) were later released on Good Vibrations: Thirty years of The Beach Boys as "Fairy Tale Music." Upon the band's return from the Netherlands in the fall, Holland was rejected by Reprise Records for not having a potential hit single. Added to the track list was an unfinished Brian Wilson song "Sail On, Sailor," that he'd originally co-written with Ray Kennedy, and finally completed with the help of Van Dyke Parks, Jack Reiley and Tandyn Almer. It would ultimately become Holland's most famous track. A casualty of the album's tracklist reshuffling was another Fataar/Chaplin tune, written with Mike Love, called "We Got Love." A live version was included on the group's 1973 release The Beach Boys In Concert. Absolutely fantastic sound on this pressing of Holland!! Dead quiet vinyl. Classic Beach Boys early 70's line-up. Do not hesitate to buy this album!! Includes We Got Love, which was originally intended for inclusion on the album way back when. Now how about an audiophile pressing of The Beach Boys in Concert double album and include bonus tracks from Surf's Up and Holland ?